Evesham Mayor Randy Brown remembers a time during his childhood when kids could still ride their bikes down Main Street, heading toward the old Kmart in Tri-Towne Plaza to check out the store’s iconic “Blue Light Special” sales. 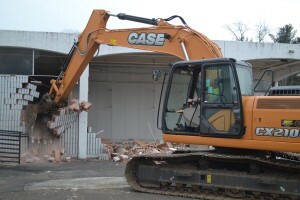 On Jan. 12, Brown and residents with similar memories of the Kmart and other stores in the now gutted shopping center received a visual reminder that time and tide truly wait for no man when demolition of the Kmart commenced to make way for the Shoppes and Residences at Renaissance Square mixed-use redevelopment project. 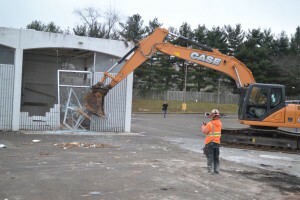 The project, first announced in October 2014 by Brown and shopping center owner Richard Birdoff of New York-based RD Management, will transform the area into a site with more than 250 apartments, two restaurants and 12,000 square feet of retail near Route 70. About another 80,000 square feet of retail is also slated for the part of the shopping center that once housed retailers such as Kobe Grill, Subway and Super Fresh, although that area won’t go through full demolition as the Kmart did. Tri-Towne Plaza was originally built in 1975 on 20 acres with about 180,000 square feet of buildings. Over the years, stores came and left the plaza. 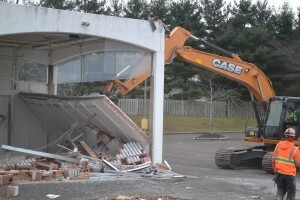 The center’s two anchor stores — the Super Fresh grocery and Kmart, which eventually became a Sears Essentials store — each closed years ago, leaving a majority of Tri-Towne unused. Brown said within two to three years, the property should have a value of more than $30 million, with the project already having received preliminary approval from the township’s planning board. Brown also said the state Department of Transportation has granted approval for the land buffering Route 70 from the start of the center to become a park where residents and shoppers can walk. 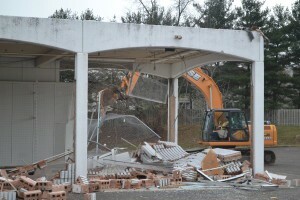 According to Birdoff, he and his associates anticipate site work and construction of one of the first residential buildings will begin this spring near the center’s Burger King restaurant, which will also eventually be demolished. “Our goal is to make this a mixed-use facility where people are going to be living here, working here, entertaining here, dining here, and it’s going to transform a site that’s been rundown for various reasons and hopefully will be the cornerstone of further redevelopment,” Birdoff said. Birdoff said he and his associates are also in discussions with several prospective retailers for the nearly 80,000 square foot retail building, and it’s their hope to have leases consummated in the spring to coincide with exterior renovations. “Hopefully, we’ll be building out the spaces for those tenants so that they would be occupying sometime in the early part of 2017,” Birdoff said. In regard to any potentially new traffic issues along boarding roads North Locust Avenue and Plymouth Drive, Brown said those would have to be discussed at the township’s planning board meetings.